Zineryt is a lotion that contains an antibiotic called erythromycin, and zinc. The two products work together in helping to prevent and reduce acne. It is usually prescribed for moderate to severe acne. The bacteria associated with acne, feeds on the oily substance produced by glands on our skin. This produces waste products that irritate the glands on the skin, causing spots and inflammation. Zineryt contains an antibiotic called erythromycin, which reduces the growth of the bacteria. Zineryt also contains zinc, which reduces inflammation caused by acne, and also reduces the production of oil by the skin. How do you use Zineryt? How often should I use Zineryt? Zineryt should be used twice a day. Once in the morning and once in the evening. Can I use make-up with Zineryt? If you wish to apply make-up, apply Zineryt before hand and wait for it to dry first. What if I forget to use Zineryt? If you forget an application of Zineryt, continue your next dose as usual. You should not apply more than the prescribed amount to compensate, as this may irritate your skin. Forgetting the odd application will not have any long-term effects on your treatment. Where can I use Zineryt? You can safely apply Zineryt on your face, back or chest. How long does it take for Zineryt to work? It usually takes around 8-12 weeks for optimum results. If you have not seen any results after 8 weeks, you should contact your doctor or pharmacist for advice. If the treatment has been successful after 12 weeks, you should stop using Zineryt. You can continue to use it again if the acne returns at a later time. How long does Zineryt last for? One bottle of Zineryt has a shelf life of 8 weeks. Our pharmacists will make up the preparation in our pharmacy, using a sterile technique. Zineryt is effective in treating acne that is associated with a presence of bacteria. Your clinician will be able to tell you if Zineryt is the correct medication for you, by examining your acne. Who should not use Zineryt? 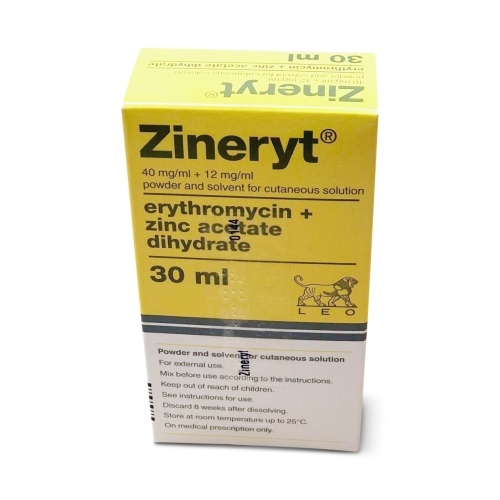 You should not use Zineryt if you are receiving treatment with antibiotics that belong to the same class as erythromycin, such as clindamycin and lincomycin. This can cause cross-resistance. Can you use Zineryt when pregnant or breastfeeding? Zineryt is safe to use in those that are pregnant or breast-feeding, provided that you do not use the treatment on the chest. Can I use Zineryt with other medication? You can use Zineryt with most other medication, including other topical treatments for acne such as Differin and Epiduo. You should not use Zineryt with other antibiotics that are being used to treat your acne, unless on the advice od a specialist. Where can I buy Zineryt? You can buy Zineryt online after completing the online questionnaire. This allows our medical team to determine whether or not it is suitable for you.